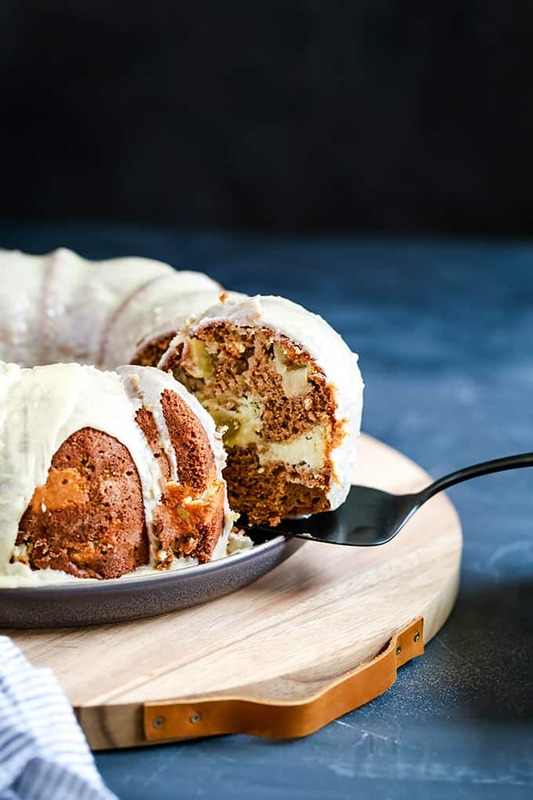 This Apple Cream Cheese Bundt Cake recipe is the perfect fall – or anytime! – dessert. I dare you not to fall in love with this cinnamon spiked, apple studded cake with a tunnel of cream cheese baked inside and cloaked with caramel icing. Now that the cooler autumn weather has arrived, it’s all about the comfort foods of the season. Basically all things apple and pumpkin are fair game. And after being married for 16 years, I know that apple desserts are the key to my husband’s heart. 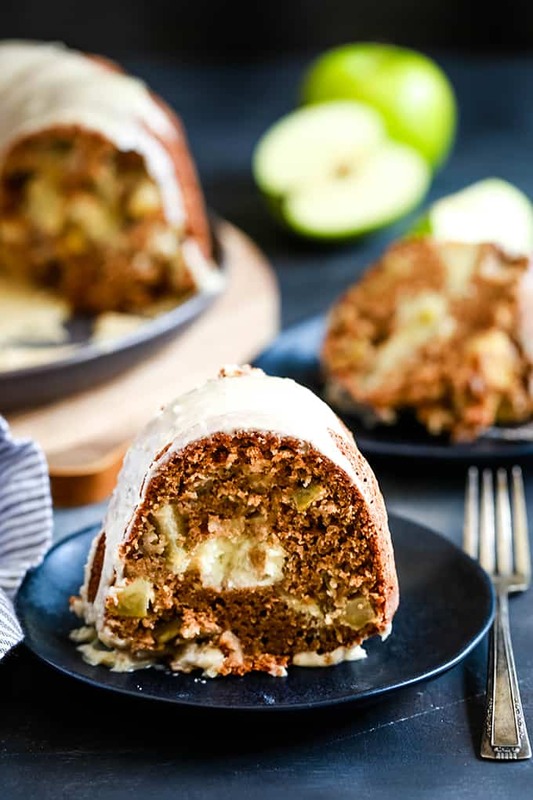 Definitely the inspiration behind this Apple Cream Cheese Bundt Cake. He’s the biggest fan of my Snickerdoodle Apple Crisp and was the one who actually shared with me the recipe for my Cinnamon Sugar Apple Cake. And don’t forget the Apple Piecaken – the whole apple pie baked in a cake! – I made for his birthday this year. 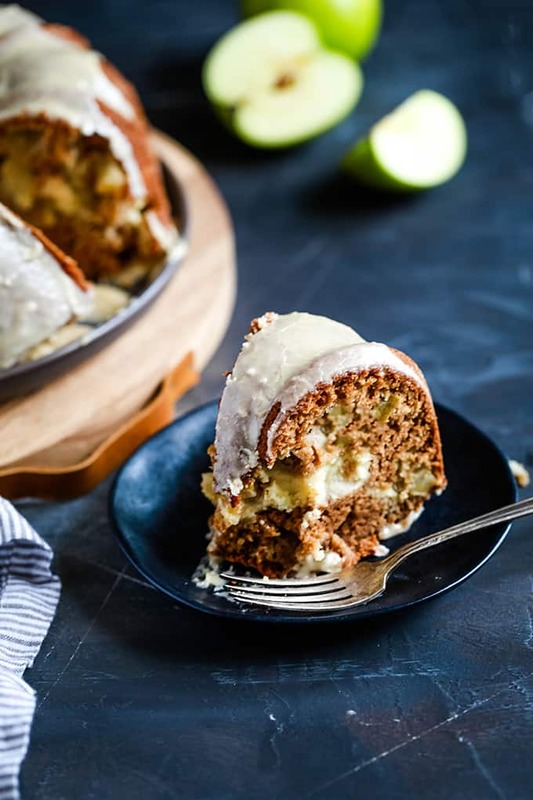 This Apple Cream Cheese Bundt Cake recipe is a combination of his love of all things of apple with my love of cheesecake. A cinnamon spiked cake studded with apples with a tunnel of cream cheese baked in the middle and it’s all cloaked in my Homemade Caramel Icing. First up is the cream cheese filling. Six ingredients that you likely already have in your kitchen become a cheesecake like tunnel that truly makes this apple cake stand out from the crowd. In the bowl of an electric mixer, add cream cheese, butter and sugar. Cream together until smooth and completely combined. 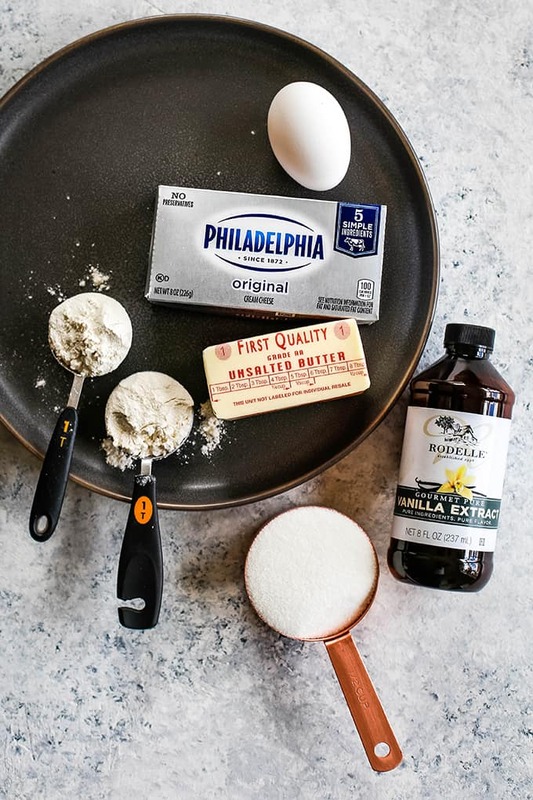 Add egg, flour and vanilla and mix until just combined. Set aside. Next up is the cake batter. No mixer required. Instead, the batter for this Apple Cream Cheese Bundt Cake is simply stirred together. 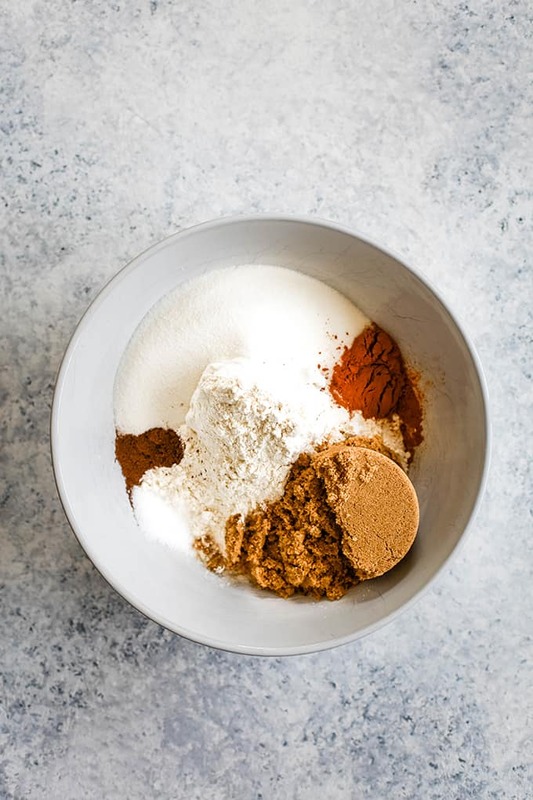 In a large bowl, whisk together flour, sugar, brown sugar, cinnamon, salt, baking soda and allspice. Add eggs, applesauce and vanilla and stir together until just combined. Stir in apples until just incorporated. Pour 2/3 of cake batter into bundt pan. 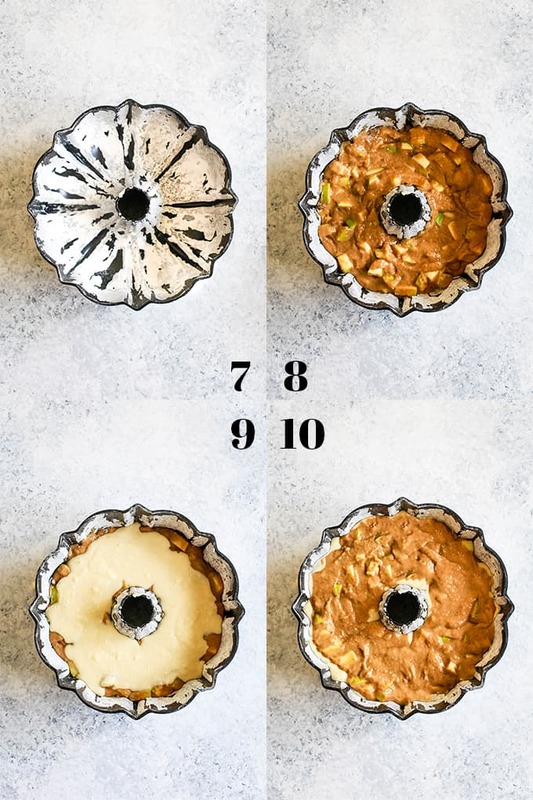 Leaving a 1″ border around edges of bundt pan, spoon cream cheese filling over batter. Using a knife, swirl filling through apple mixture. Pour remaining cake batter over cream cheese filling. Bake for 60 to 75 minutes or until a toothpick inserted in center comes out clean. 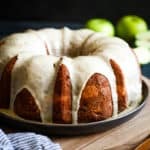 I guarantee it will be love at first bite after a slice of this Apple Cream Cheese Bundt Cake. All six of us sitting around our dining room table gave it two thumbs up. If you only knew how picky two of my children are when eating, you’d know that this was a definite seal of approval! 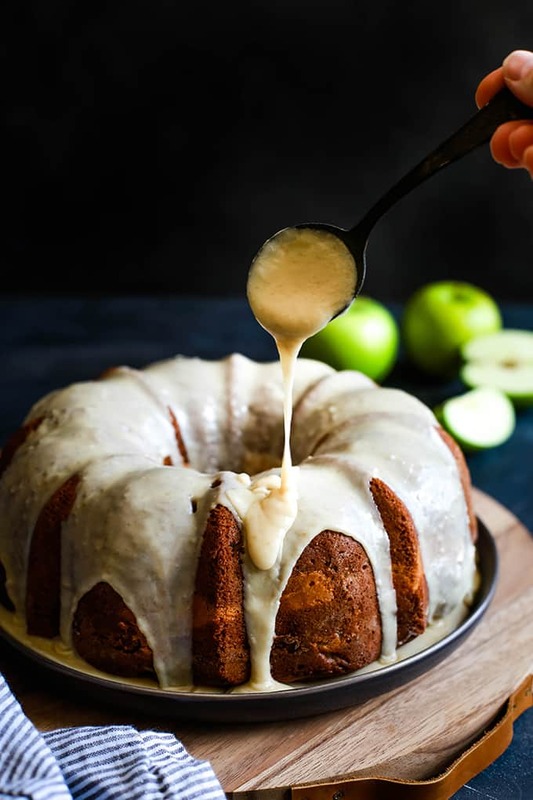 This Apple Cream Cheese Bundt Cake recipe is the perfect fall - or anytime! - dessert. I dare you not to fall in love with this cinnamon spiked, apple studded cake with a tunnel of cream cheese baked inside and cloaked with caramel icing. In the bowl of an electric mixer, add cream cheese, butter and sugar. 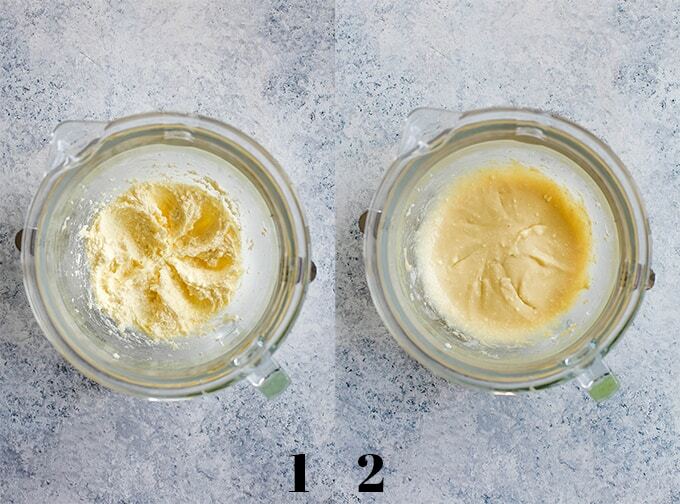 Cream together until smooth and completely combined. 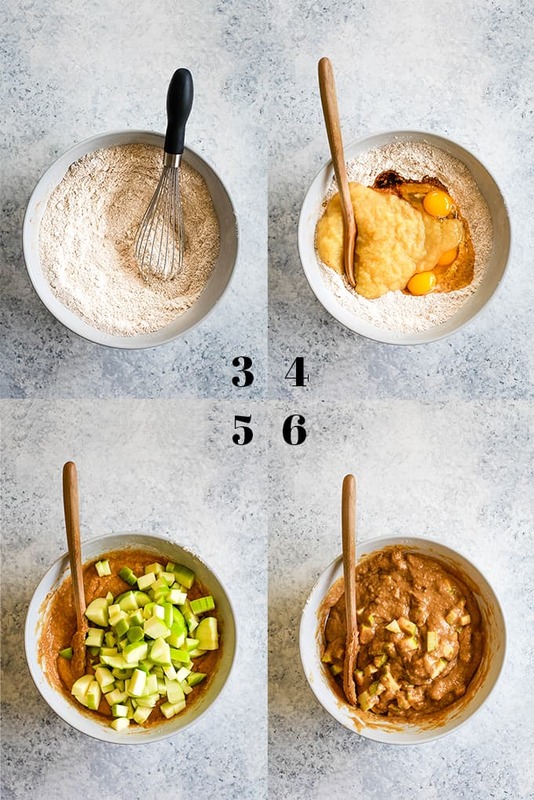 Add egg, flour and vanilla and mix until just combined. Grease and flour bundt pan and pour 2/3 of cake batter into pan. Leaving a 1" border around edges of bundt pan, spoon Cream Cheese Filling over batter. Using a knife, swirl filling through apple mixture. Pour remaining cake batter over Cream Cheese Filling. Bake for 60 to 75 minutes or until a toothpick inserted in center comes out clean. Cool cake in pan on a wire rack for 15 minutes before removing cake from pan to wire rack to cool completely. Prepare Homemade Caramel Icing per instructions. Immediately drizzle over cooled cake. Don’t put away your bundt pant just yet! You’ll also want to try this Glazed Old Fashioned Doughnut Bundt Cake, this classic Marble Yogurt Bundt Cake and this fun Root Beer Bundt Cake. 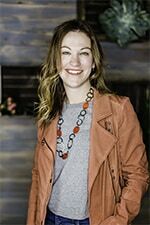 Hi, Jennifer - It's best made the day of but if you need to prepare in advance you could make it the night before and store in the fridge and allow to come to room temp prior to serving. So glad you enjoyed it, Carlos! Hi, Ruth - No peeling needed! I made this last night. Haven't tasted it yet. I followed it to a t but it seemed like too much batter for my pan. It rose beautifully and was out of the bundt pan. Maybe a measurement for the apples instead of just saying 3.... Maybe i had too much apple that I added that changed the amount of batter? I bake all the time and I couldnt figure out what I didn't wrong. Hi, Lisa! Hmmm. I've never had this cake batter pour out of the pan before. Feel free to e-mail to troubleshoot! this is a seriously gorgeous cake! You're so kind - thanks, Jessica! 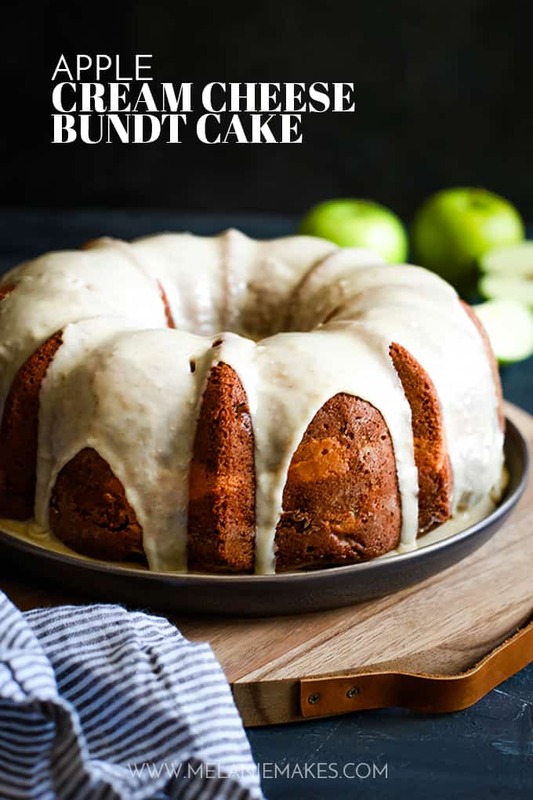 I was looking for a apple bundt cake! This one looks so good! I have no doubt you'll love it, Abeer! This apple cake makes me crazy. Incredibly beautiful! Great recipe! I think this will be one of my favorites. You're so sweet, Chrissie - thank you! This looks so tasty and delicious I cannot wait to try it! This sounds so good! I bet it makes the house smell amazing too! The perfect fall treat! I will be adding this to my list of must make desserts. Can't wait for you to try it, Jacque! Can I make the cake with out using the cream cheese or will it be too dry?